Food magazines are a big problem in my house. I only receive two a month (Bon Appetit and Cooking Light), but I refuse to throw them away. They are stacked and stashed in all over our condo, probably taking up more than their fair share of space, because you just NEVER KNOW when you might need the Thanksgiving 2005 (or was it 2006?) Bon Appetit that had a really, really good squash gratin recipe. My mom has a Bon Appetit from 1981 that has the world’s most amazing cheesecake recipe, so I come by this particular hoarding tendency naturally. I wish I had through of The Bitten Word, which is one of my favorite blogs, and I would feel much better about the magazines that spill out whenever I open certain drawers. I am very glad the October issue of Cooking Light was still on the coffee table, because this was one awesome side dish. 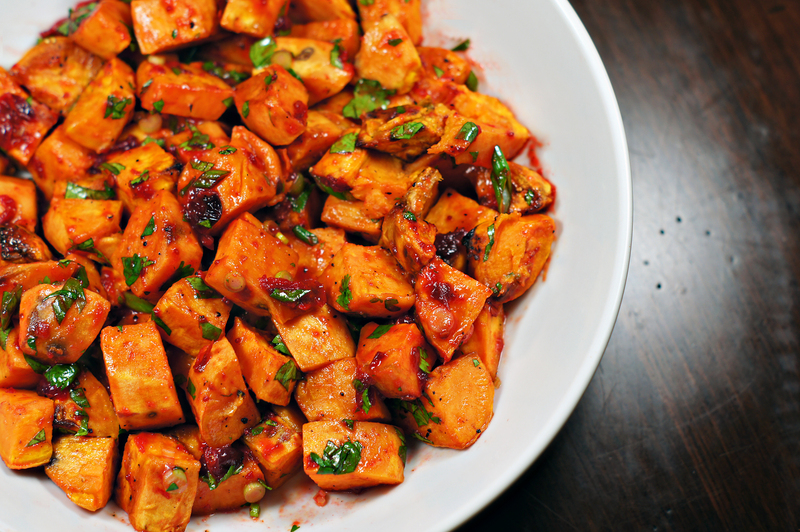 I love sweet potatoes, and I love sweet/tart/spicy combinations in sauces. This hits all those notes beautifully. I already have ideas about how to adapt the cranberry-chipotle pairing into other recipes. I love it when that happens. Preheat oven to 450°. Place sweet potatoes on a large jelly-roll pan. Drizzle with 2 tablespoons oil, and sprinkle with salt and pepper; toss to coat. Bake at 450° for 30 minutes or until tender, turning after 15 minutes. Combine remaining 1 tablespoon oil, cranberries, water, and honey in a saucepan. Finely chop the chipotle pepper. Add chopped chipotle and 1 teaspoon adobo sauce to pan. Place pan over medium-low heat; bring to a boil. Cover, reduce heat, and cook 10 minutes or until cranberries pop, stirring occasionally. Remove from heat. Mash with a fork until chunky. 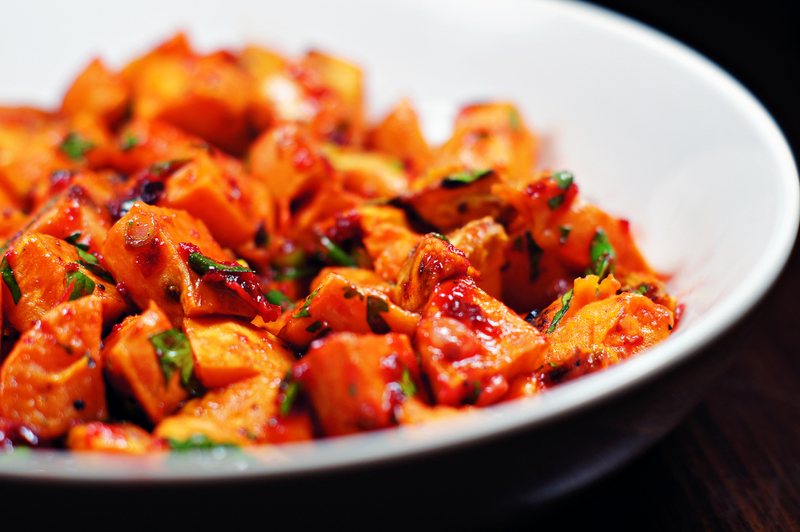 Combine potatoes, onions, and cilantro in a bowl. Add cranberry mixture to bowl; toss gently to coat. Anyone who grew up an Army brat has developed a real love/hate relationship with Burger King. For those who don’t know, basically every Army post has a Burger King, and it was generally the only food option. Posts now have Starbucks, Dunkin Donuts, Taco Bell and more. We always had a free standing Buger King, and a PX foodcourt full of generic fast food knockoffs like Anthony’s Pizza and Robin Hood Sandwiches. Burger King was the way to go…but that often meant getting sick of it, and quickly. But I loved Burger King for one reason…the onion rings option. 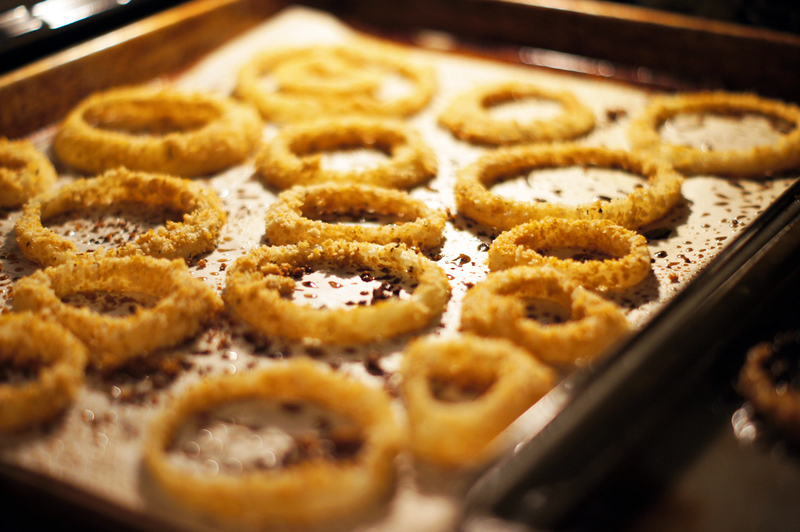 I love onion rings, and almost always opted for those instead of fries. 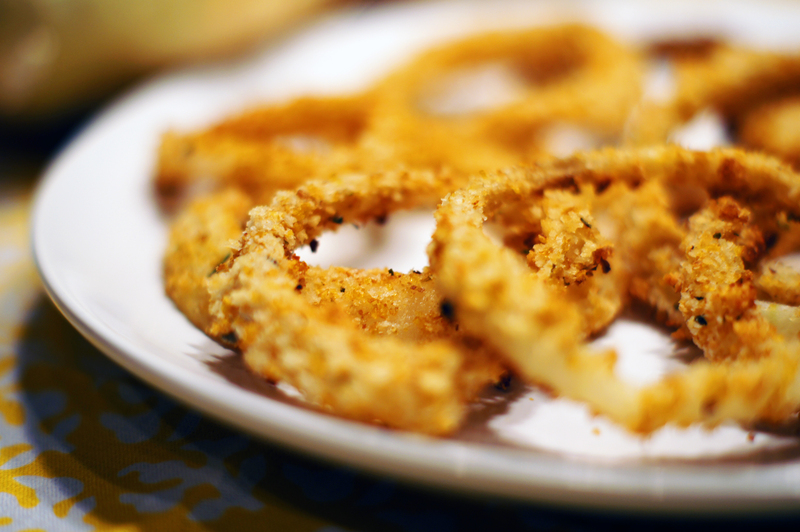 When I saw a recipe for “skinny” onion rings, I knew I needed to try it. Personally, I don’t fry things at home. It’s messy, it’s greasy, it’s generally a pain. Not to mention it produces some very unhealthy food. So, this baked option, using onions, low fat buttermilk, panko and not much else, really jumped out at me. One, LINE THE BAKING SHEETS WITH PARCHMENT. Don’t skip it, don’t think you can just sprayy them with Pam…rings on an unlined sheet will burn. Trust BistroBess. Two, BREAD THE RINGS IN SMALL BATCHES. My breading got wet and clumpy really fast, and once that happens, nothing sticks. I had to toss out my first batch less than halfway through the process and start over. My suggestion would be to mix up the breading in one bowl, and add it to a seperate breading bowl a small amount at a time. Put in about enough breading for 2 or 3 rings, bread those, wipe out the bowl, and add fresh breading crumbs for the next few rings. It takes more time, but your results will be dramatically improved. If you follow these two guidelines, the reward is crispy, hot onion rings that you don’t feel bad about eating. But don’t worry, Burger King, your onion rings will always be my nostalgic fave. Slice onion into ¼ inch rings. Separate the rings (I discarded the tiny middles), and place in a shallow baking dish. Cover in buttermilk, and refrigerate for 1-2 hours. Preheat oven to 450. Combine the three types of crumbs and salt to taste in a small bowl. Have another bowl nearby for breading. Line two baking sheets with parchment paper. Remove onions from refrigerator. Put a small amount (¼ cup or less) of the breading mixture into your breading bowl. Remove the onion rings one at a time from the buttermilk, allowing excess to drip off. Quickly dredge in the breading mixture and place on the baking sheet. Repeat with all onion rings, replacing breading as needed. Wet, clumpy breading will not stick to the rings! Spray the onion rings generously with cooking spray, and bake until golden brown, about 12 minutes. Serve hot. Sorry about the break! Fall is such a busy time of year, and now that it is starting to get dark so early, my food photography window is getting smaller! I am working on a new weekend cooking schedule, so hopefully I will be back to regular posts in no time. I have a couple recipes in the queue, but I thought I would share this one first. 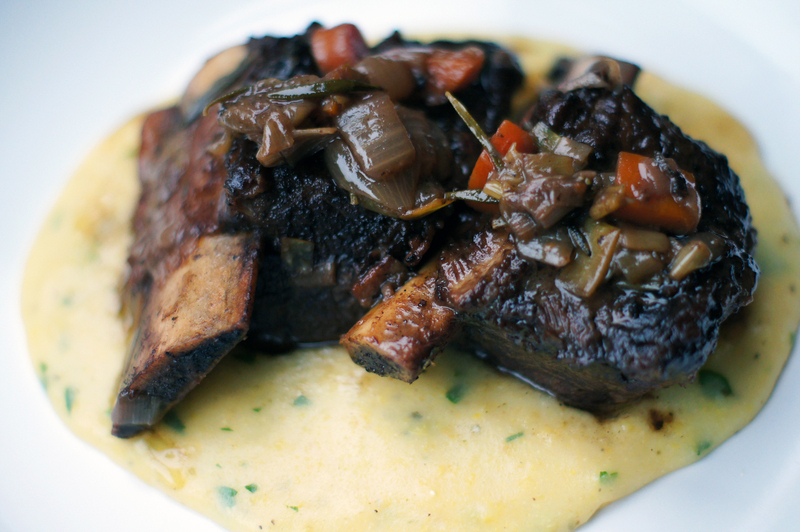 The creamy, dreamy, super simple polenta that goes so well with short ribs. Or ragu, beef stew, sauteed greens, pretty much anything. Or alone. Just make it, ok? Bring chicken broth or water to a boil. Pour in the cornmeal into the liquid in a steady stream, whisking constantly to avoid lumps. Reduce heat and allow to simmer for about 15 minutes, stirring occasionally. Once thickened, stir in butter, cheese and herbs. Taste and season with salt and pepper.